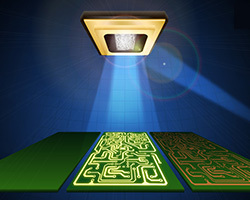 The combination of lower cost lasers, high performance DLPs and fast computers has made direct imaging lithography much more practical today than it was a few years ago. It is now possible to build machines that can directly expose lines in the photo resist of a few microns over substrates areas covering 500 mm x 600 mm. In order to obtain the desired throughput, multiple photo heads can be mounted on a single machine. Artwork specializes in high resolution rasterizers for Gerber, ODB++ and GDSII that are designed to produce the raster bitmap needed to drive these direct exposure machines. However because of the nature of the DMD optical chain, a standard bitmap is only an intermediate step in preparing the data needed to drive the exposure system. The bitmap must be sliced into a number of "bands" that match the width of the DMD. How many pixels are we talking about? That's approximately 38.1 GBytes worth of pixels1. Note 1 - it is not even possible to store this on disk as an uncompressed TIF file as the TIF file format does not support files larger than 4 GBytes. Instead we compress it using packbits which often gives us 10X to 20X compression. However this adds computation costs both in writing the bitmap to disk and later when slicing it. The direct exposure writer uses multiple heads. The substrate is scrolled in one direction - then shifted over and scrolled back in the other direction. The DMD is rotated very slightly from the scan direction. This is done to control the spacing between pixels in the direction of the scan. Such a rotation require that the bits used to control the DMD be extracted by a computation. The computation is not particularly difficult -- what is difficult is the sheer number of pixels that have to be recomputed and delivered as DMD "frames." The amounts of spot overlap in the scanning direction and its normal direction are determined by the stage speed and the rotation angle of the DMD, respectively. where x denotes the horizontal spot separation, d is the pitch size of the point array, and h is the rotation angle of the DMD. As the DMD is "scanned" across the panel (or the panel is scrolled across a fixed DMD) it needs to be provided with a large number of 1024 x 768 bitmaps. How much of the source bitmap do we need to load into our processor's memory in order to generate these frames? (89 x 1024) + 768 = 91,904 pixels. 500 mm x 1000 pixels/mm = 500,000 pixels. How many frames per scan line? This will depend on a parameter we call the scan pitch. Values can range anywhere from 1 to 7. Let's go with a pitch of 7 pixels. So we need 7 scans to cover the board at a minimum. Here is where the implication of all these calculations comes in. Basically one needs to load 5.7 GByte of bitmap data into memory and then compute 61,500 frames per scan line. This is a lot of bit shifting. Unfortunately our memory footprint is so large that the bits we need to access to compute each frame don't fit into the local CPU memory cache. This means it takes a lot more CPU cycles to do our computations. A prototype program we wrote to do this kind of frame extraction seems to produce about 150 frames per second (XGVA) and even less if the DMD is an HD one since the larger frame size requires even more memory. At that rate extracting the 61.5K frames for a single scan across the panel will take 410 seconds; 7 such scan lines will take a total of 47 minutes! Since it only takes 3 to 5 minutes to produce the 37 GByte (before compression) bitmap for the panel we see that the frame extraction is a serious bottleneck if done on a conventional workstation. Our attempts at using a workstation CPU to convert from a regular bitmap into a series of rotated frames shows that this can be a serious bottleneck for large area, high resolution masks. Assuming this throughput is not acceptable one could build some dedicated hardware to greatly accelerate the process. However, designing and building such hardware in relatively low quantities is extremely expensive. We decided to examine whether today's modern GPUs might be adapted to speeding up the process. An extremely powerful graphics GPU can be purchased these days for between $300 and $500.